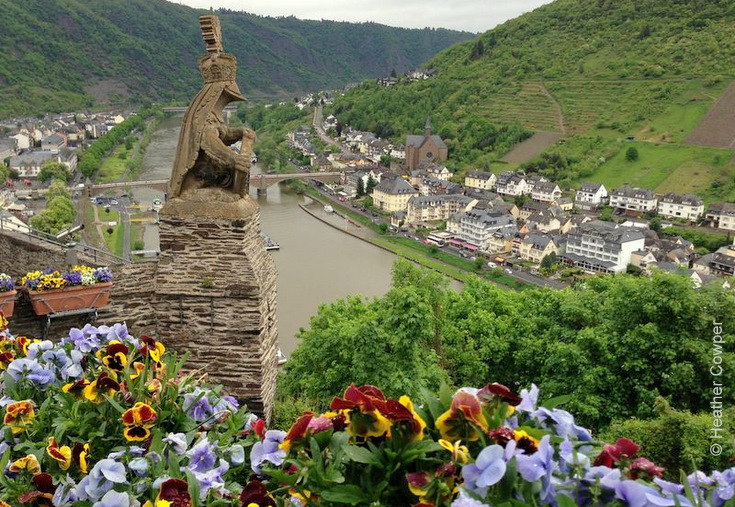 Today the Amadeus Princess took a detour from the Rhine, up the Mosel river to the town of Cochem, overlooked by a picturesque castle on the hill. Although built in the 11th century, the Reichsburg castle was given the fashionable romantic look of towers and turrets when it was restored in the 1860s by the wealthy German industrialist, Jacob Louis Ravené. Millions of German marks were spent rebuilding and renovating the castle with the modern conveniences of electricity and running water, with decoration in romantic neo-gothic style. The Ravené family used the castle as their summer residence and we enjoyed the intimate feel of the castle, with rich furnishings, suits of armour and colourful painted walls. After our castle visit we walked down to the old town where narrow stone staircases lead down from the old monastery building above the town. Closer to the river we heard how the shops are sometimes flooded when the river rises, so the businesses monitor the water level at Trier further up river and get sufficient warning to empty out all their goods before the flood hits Cochem. Our tour finished with a wine tasting where we learned how the best vines of the Mosel region grow on south facing slopes on a bed of slate, which acts like a radiator to help ripen the grapes. The Riesling grape is well suited to the damp, cool summers and requires a long growing season before being harvested by October. A special variety of red-fleshed peach is also grown in many vineyards and is used to make a peach liqueur that is delicious mixed with sparkling white wine to make a Kir Moselle. Continuing with the local food and wine theme, at lunch we enjoyed some fat white asparagus that is in season here, that we’d seen being sold in all the markets. As the ship was not due to sail until the evening, we took the opportunity to borrow bikes from the ship and spent an hour cycling along the path beside the river with views of the old painted houses built hard up to the rock below the castle. After dinner, it was time for the crew’s cabaret show and had a laugh at our waiters performing their version of Swan Lake in pink net tutus. Tomorrow we arrive at Cologne where we disembark, although the ship continues to Amsterdam.